I don’t know about you, but I’m all about cooking once, eating twice (three times if I’m lucky! ), without having my leftovers feel too…leftover-y. Turns out that “remixing” leftover ingredients – or transforming one meal into something totally different – is a great foolproof solution for this. That’s exactly how my roasted quinoa burgers came about. 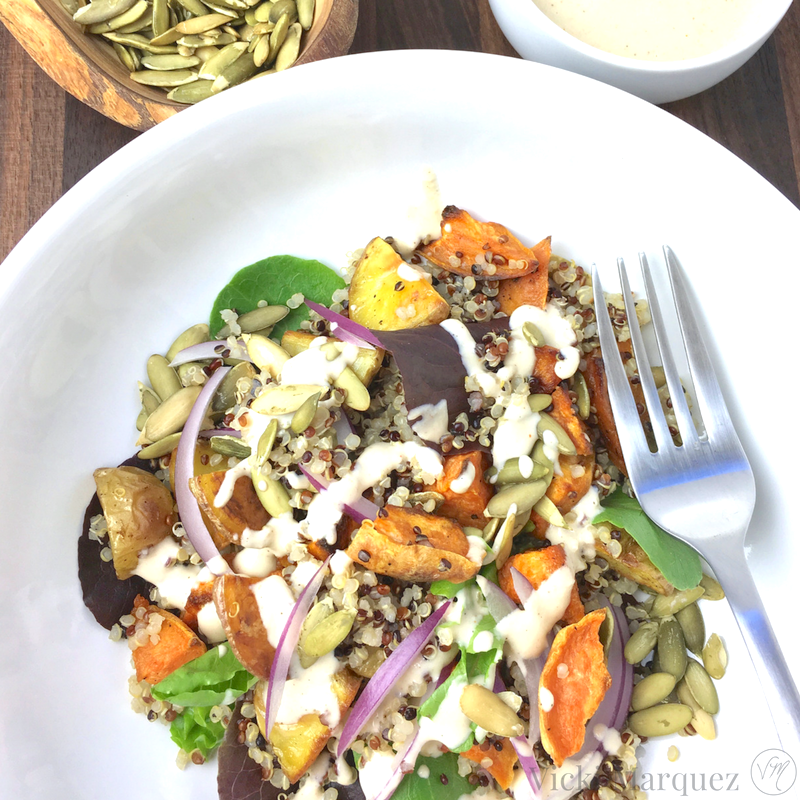 A simple salad topped with roasted veggies, some cooked grains and a basic dressing or vinaigrette. I was getting a little bored with my trusty salad, so I decided to “remix” it. I mashed my roasted veggies, mixed them with my cooked grains and made burgers instead. Cooked grains and smashed root veggies – or mashed beans (like in the case of these Black Bean & Brown Rice Burgers) – make a burger mixture that binds together nicely, without eggs. This recipe is super basic, but you can jazz up the flavor profile by adding more veggies and/or spices to the burger mixture…or by slathering on a delicious sauce like pesto, harissa or a chive and cashew cream. I topped mine with my exact salad ingredients: mixed greens, sliced red onion, pumpkin seeds and a drizzle of my spicy tahini dressing. So good. In a bowl, toss the potatoes with the olive oil, salt and pepper and then transfer to a parchment lined baking sheet and roast until the potatoes are soft and golden, about 30 to 35 minutes. *NOTE: you can use any roasted root veggies that you like for these burgers. 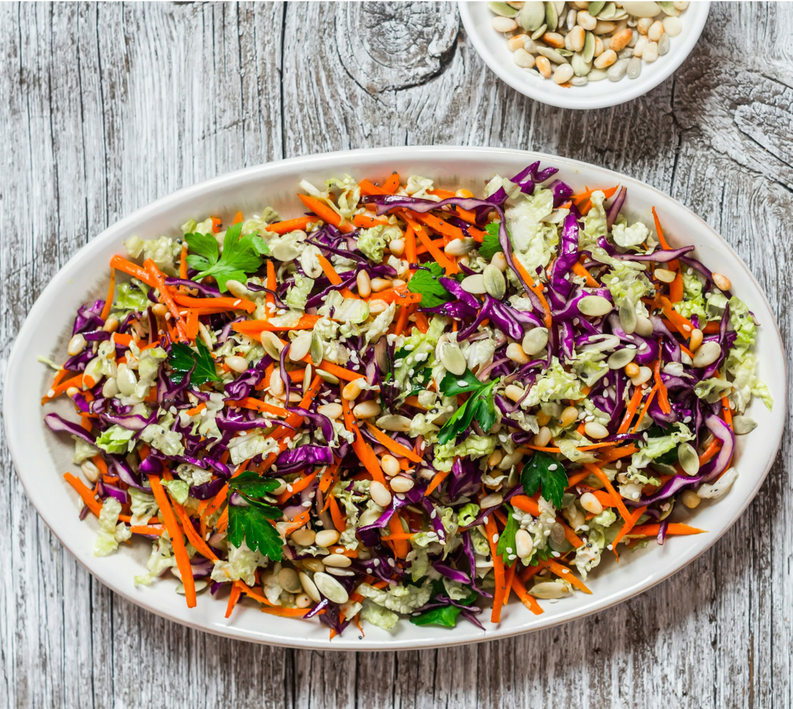 While veggies are roasting, prepare the dressing by whisking together the first five ingredients in a small bowl and adding warm water to thin to desired consistency. Mash your roasted veggies in a bowl and stir in quinoa, mixing together until well combined. Form small patties out of the mixture and pan-fry until edges are crispy, about 3 minutes per side. 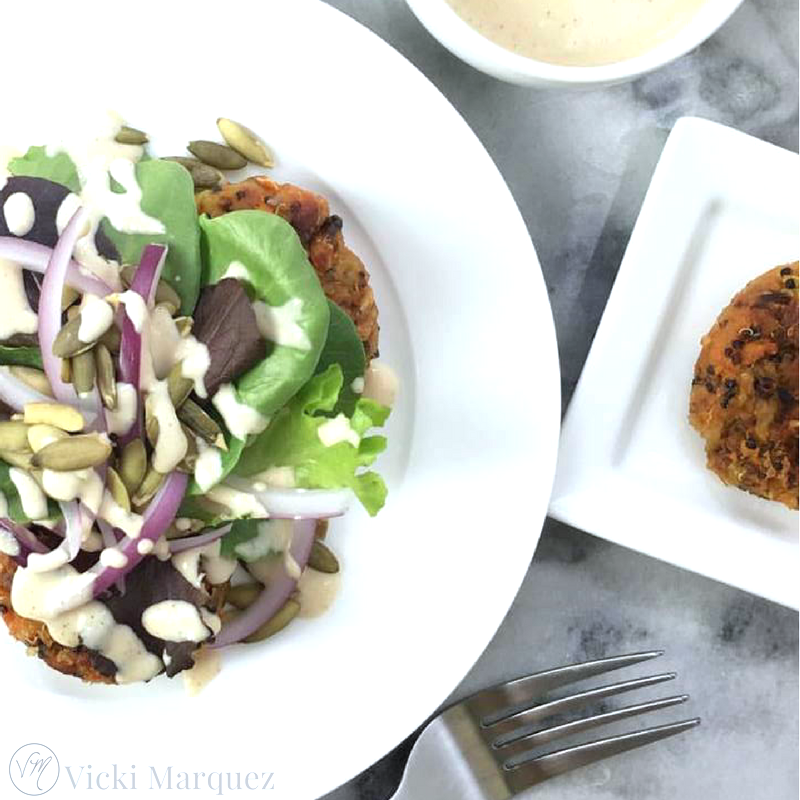 Top with mixed greens, red onions, pumpkin seeds and drizzle spicy tahini dressing on top. I’ve been getting lots of questions and comments (thank you, thank you, thank you!) 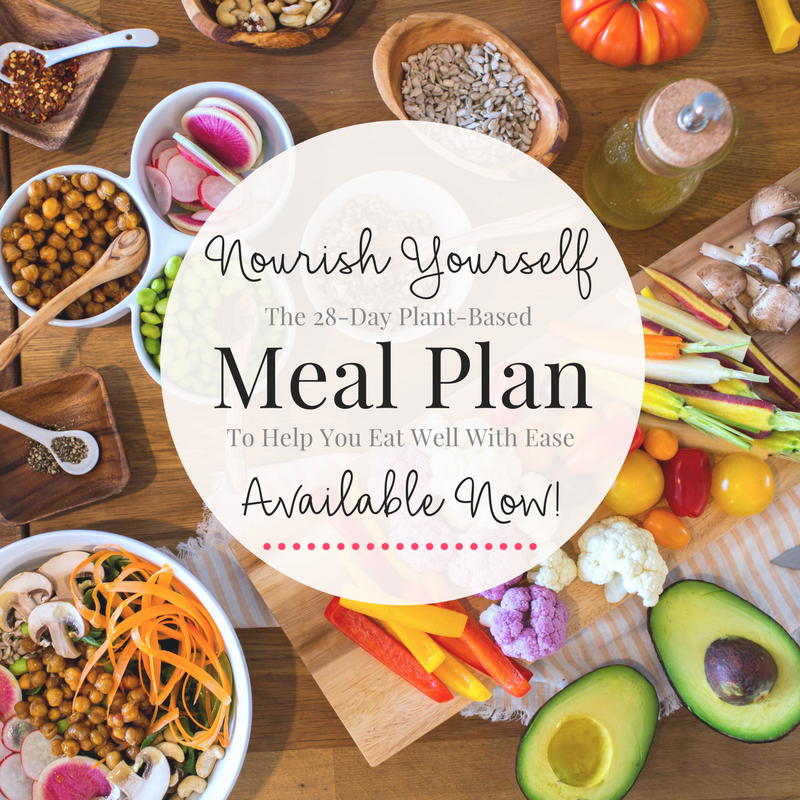 about my 28-day meal plan, Nourish Yourself, that I announced here. And there is one important reoccurring question that I want to address right away. 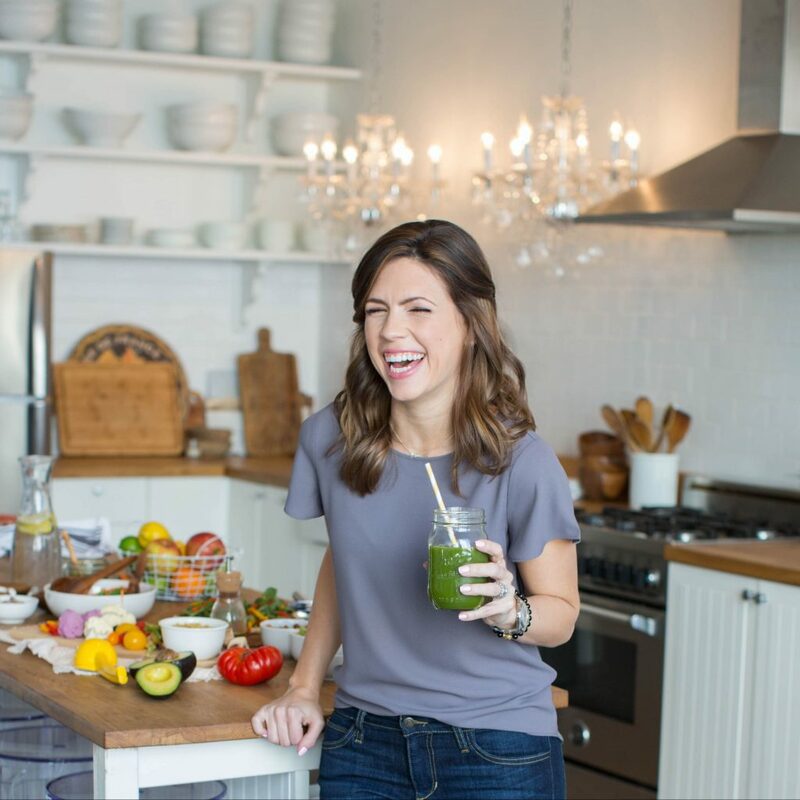 Some form of, “Is this a liquid DETOX that’s all starvation nation for 28 days?” has been rolling in from clients, VM subscribers and Nourished viewers about the program – and if they’re wondering, you might be too. You know I LOVE food and I’d never create (or sell) anything that didn’t jive with the way I actually live and eat. 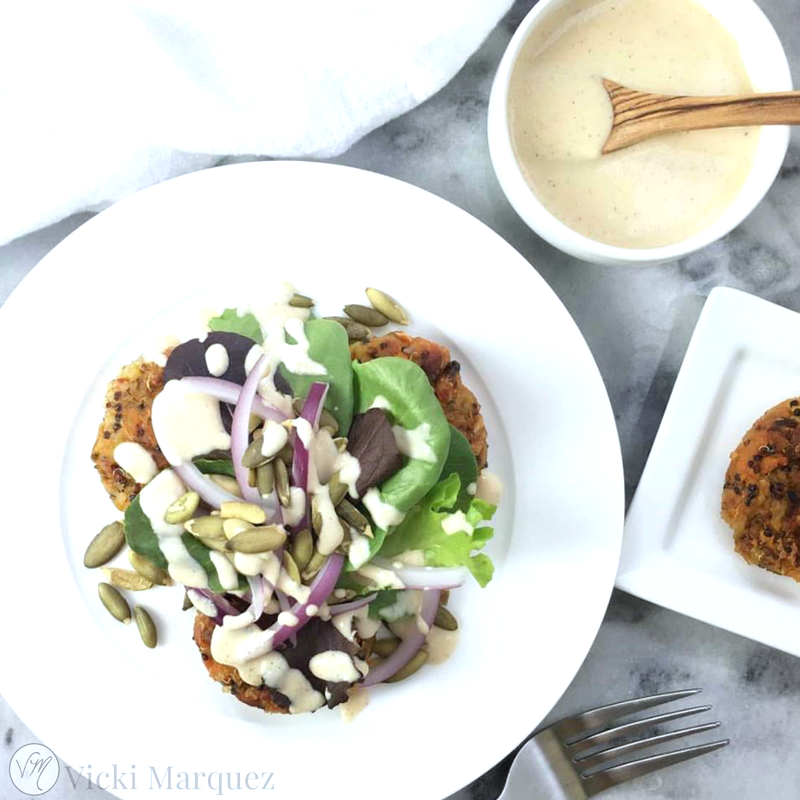 This is a program filled with REAL FOOD and hearty meals, just like these Roasted Quinoa Burgers. 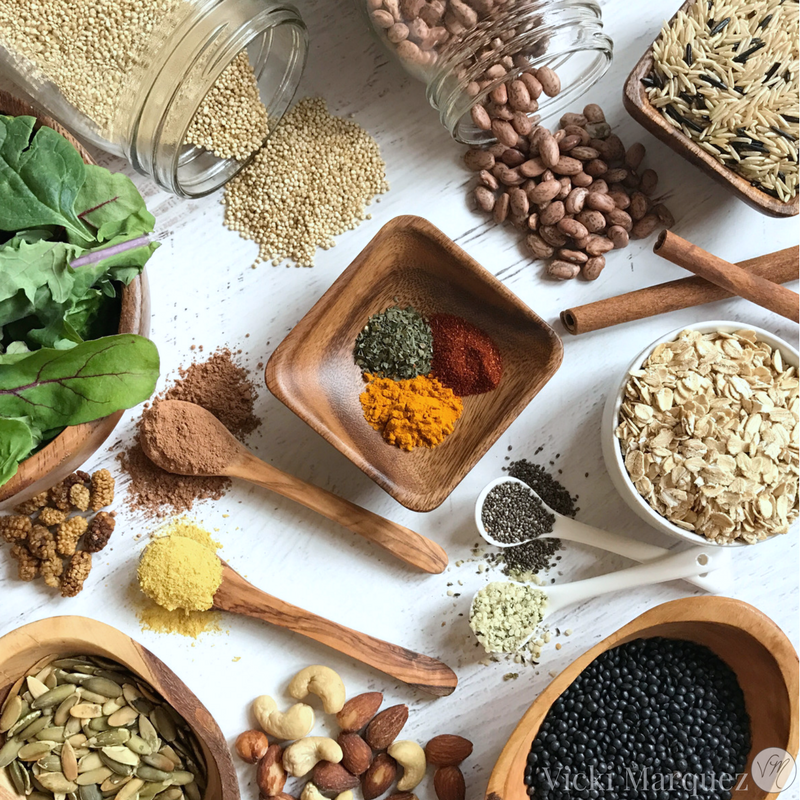 I promise you there is no deprivation or starvation – only healthy versions of the foods you already love and crave…think mac n’ cheese, tacos, banana bread pancakes and more! 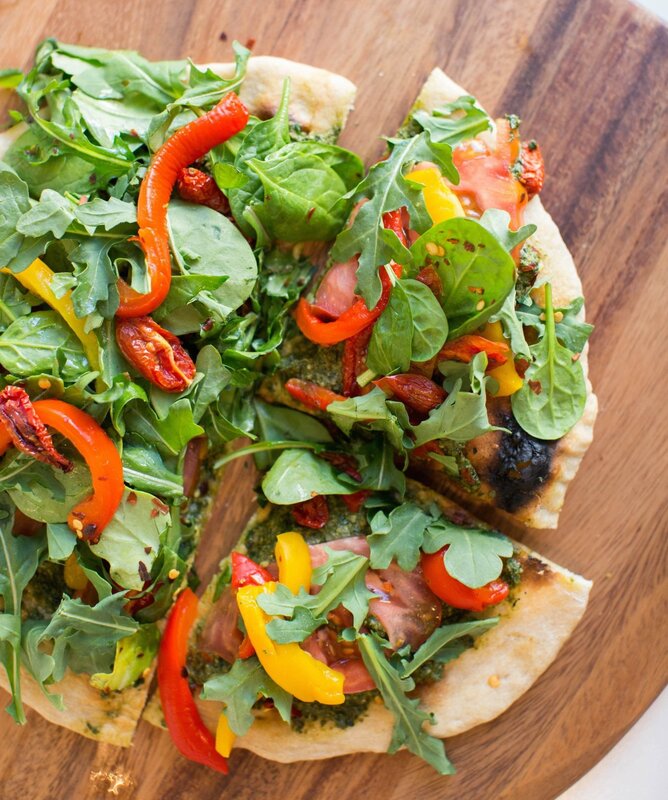 It’s delicious and filling and you can LEARN MORE HERE –> NOURISH YOURSELF. 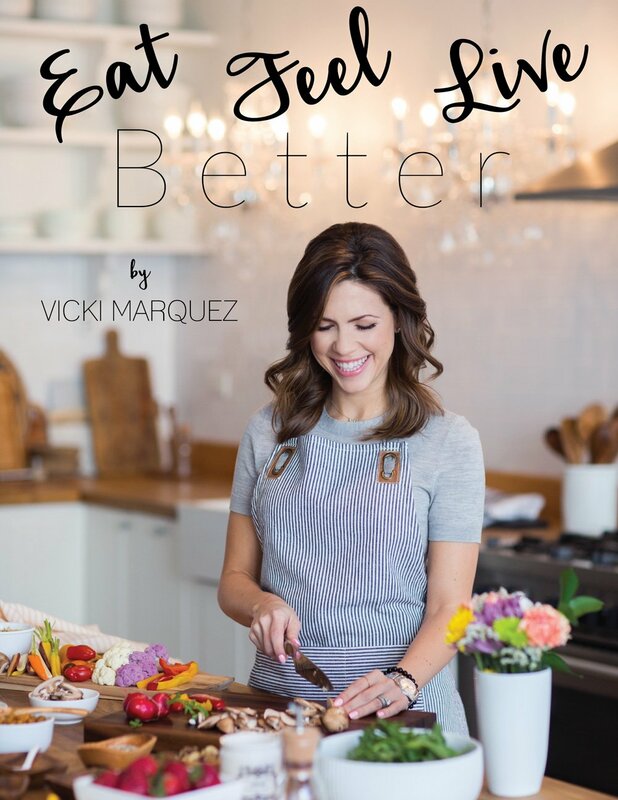 SO SO SO excited to try your meal plan. I did a liquid detox ONCE and never again, but I really am looking for something to help me eat better and not starve. Plus I’m very interested in going more plant based. 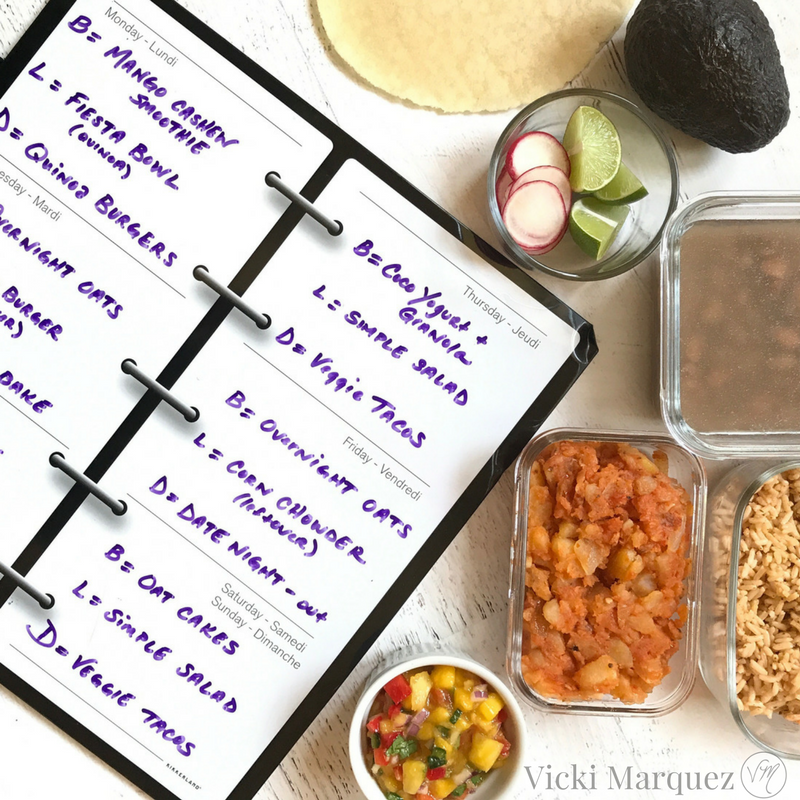 Love this recipe and can’t wait for the meal plan. Umm…mac n’ cheese, tacos, banana bread pancakes…YES PLEASE! Where, when and how can I get this? I know right, Denise?!? 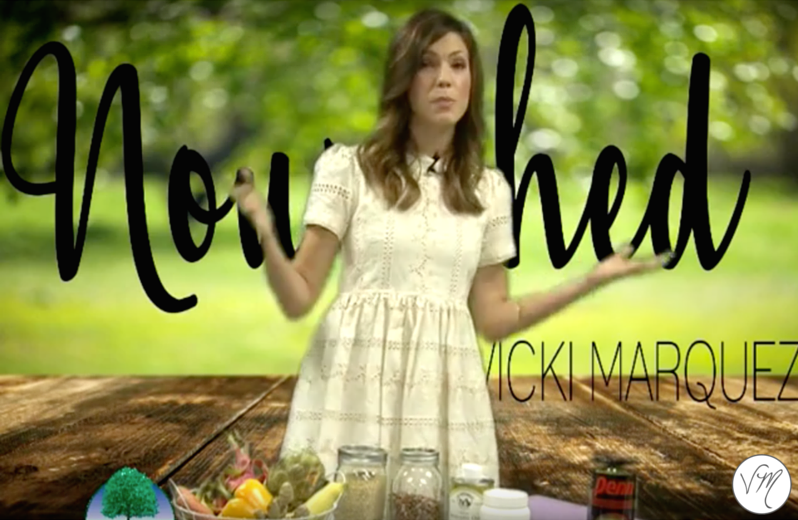 😉 The Nourish Yourself meal plan will be available September 26th — right here at VickiMarquez.com. Look for Meal Plan in the menu bar to purchase and make sure you’re on the VM Subscriber list to get exclusive discounts and bonuses!